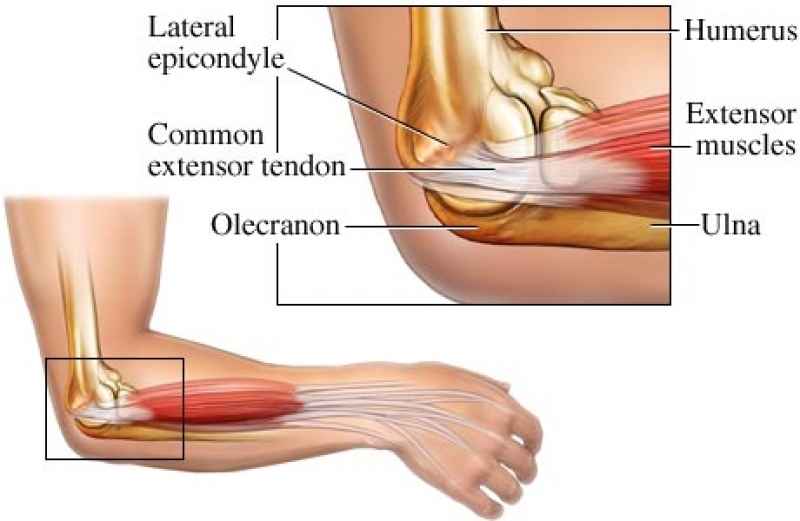 Lateral epicondylalgia, also known as Tennis Elbow (TE) is a soft tissue condition where the extensor tendons (attaching from forearms to elbow region) become overused, creating pain and tenderness symptoms upon movement. The pain is thought to be caused by the tendon swelling, as a result of overuse, which causes it to become thickened and over time, leads to tissue degeneration. Getting this problem under control early helps reduce prolonged difficulties and dysfunction. Don't let a little elbow pain get worse! (It is hard to rest our hands they way our body may like sometimes). This condition is more often associated with repetitive overuse of the wrist and forearm muscles. It originally received its name for the common presentation in tennis players, whose extensor tendons became irritated by a large, or too heavy racket used during games. Tennis elbow more recently is most prevalent in individuals who perform repetitive tasks at work, such as excessive typing, lifting or forearm movements (using a screw driver, wringing clothes, washing windows/cars). This condition is typically seen in your dominant arm, as this will be the side that is favored and therefore used more repetitiously. Generally, dull achy pain is felt on the outside of the elbow region, and when irritable, can extend into the forearm muscles. Pain onset usually occurs later in the day, after work, or after mechanical stress on the tissues. If left untreated, Tennis Elbow can lead to a loss in range of motion in bending/straightening your elbow, as well as rotational limitations. A loss in strength of these forearm muscles is also common with Tennis Elbow. Differential Diagnosis - Is it really Tennis Elbow? If you are experiencing any numbness or tingling into the arm, elbow, wrist or hand, the cause of your symptoms may not be local to the elbow. 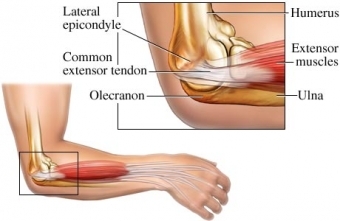 The extensor muscles affected my tennis elbow are dissected (split) by the Radial Nerve, which supplies sensation and muscle strength of the forearm and hand. If this nerve is irritated at any point along its pathway, especially near to elbow, it can present as a “Tennis Elbow”, but it not truly a muscle/tendon cause. Your physiotherapist is an expert at differentiating your elbow pain from other causes and will ensure that the treatment plan will target the underlying cause and the appropriate tissues. Along with numbness and tingling, sometimes a sore elbow can be a symptom that is caused by cervical (neck) dysfunction. Our spine, the neck specifically) holds all of the nerves that innervate or supply the upper extremities. As they exit the spine and extend down into the arms, a nerve can become disrupted at the spinal segment, or through other tissues along its length. It is important to clear the joints that a nerve passes through in order to understand what caused your elbow pains to begin with. Your physiotherapist may examine your neck and spinal region to see if any of your elbow pain may be associated with cervical changes. Tennis Elbow is a common soft tissue injury seen in physiotherapy, and is very treatable. Initially, treatment is aimed at reducing pain and eliminating painful movements (repeated lifting/twisting/typing); if it hurts, don’t do it! Producing excess pain at the elbow site may further irritate the tendon and cause degeneration, which makes treatment times more prolonged and will delay healing of the tissue. Physiotherapy offers a variety of modalities that aim to manage pain and decrease inflammation, which may be helpful in the early stages of treatment. Once the pain is under control, gentle stretching of the extensors and slow progressive strengthening to build up the tendon integrity will be implemented. Gentle tissue massage may be required to help with sensitivities and gradual reintegration of lifting, typing, twisting movements will occur. In persistent tennis elbow, there are self-management techniques and self-mobilizations that can keep symptoms at bay. This might be something your physiotherapist may incorporate into your treatment. In some cases, with persistent tennis elbow, specially designed braces can be prescribed to manage pain during daily activities that may not be able to fully stop irritating the tendon – such as a desk job, manual labor, typing position. A brace can be fitted to your elbow to decrease the local pulling at the tendon site, and help to offload the lateral epicondyle (outer elbow bone bump) for pain management. Soft tissue injury like Tennis Elbow can take anywhere from 6-12 weeks to fully heal and be symptoms free, but the important factor in determining a prognosis is how quickly treatment is initiated from the onset of pain/discomfort. Generally, the longer Tennis Elbow is present without management, the longer it will take to resolve. The risk of tendon thickening and repeated microtrauma to the area can significantly affect tissue healing, and lead to further tendon degeneration if continued. Tissue degeneration will impair blood flow to the area which makes healing much more difficult to the body. This can also put your elbow at risk of future bouts of tennis elbow, as the fibers are no longer as resilient and healthy as they used to be. The key with treating tennis elbow is to catch it early, before repetitive movements cause further irritation and damage.